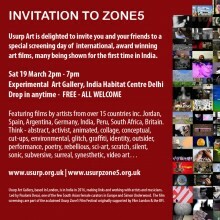 The Usurp Zone5 Film Festival is screening over 80 experimental, art films across venues in New Delhi, India. A major screening is at the iconic India Habitat Centre on 19 March 2 – 7pm at The Experimental Art Gallery, ICH, New Delhi. 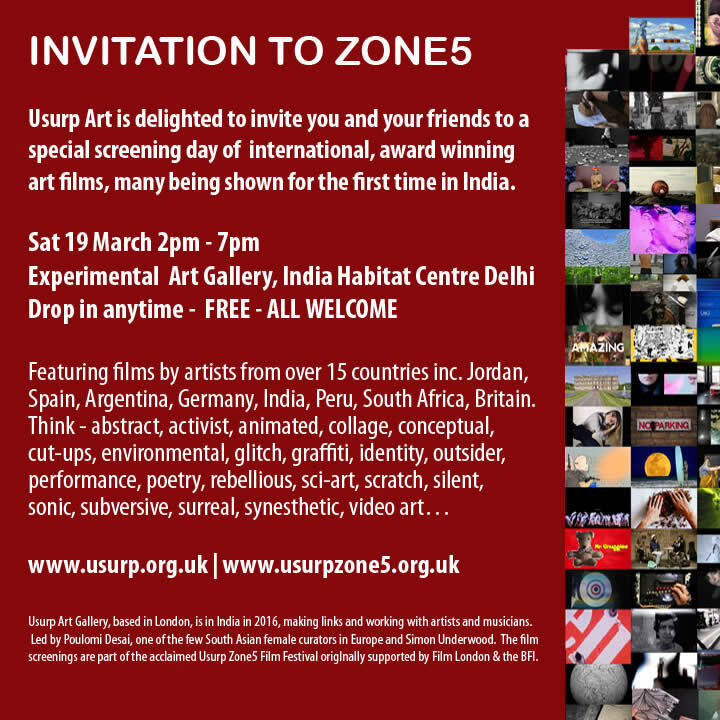 The UsurpZone5 Film Festival is curated from an open call by Usurp Art Gallery, that received over 460 compelling submissions, from every continent and over 60 countries. This ambitious festival highlights the politics of DIY creativity at a time of cuts and austerity. The programming for the festival employs an experimental process that breaks with conventional curatorial authorship and fosters a more democratic spectatorship, enabling viewers / audiences to create their own surprise links, chance connections and perceptual analysis. Thanks to all the international filmmakers, audiences and sponsors who made the Usurp Zone5 Film Festival a great success, and continue to support the ongoing screenings. See Zone5 2015 for full details. “Let the signifiers emerge. You come across a shot you hadn’t noticed before. You have to leave your intentions aside; when you watch a film with a specific intention, it dies. Sometimes what you find is yourself.” Michel Chion. 6 June 2008. Paris Transatlantic Magazine.